EL DIAMANTE — As part of the new home game branding to reach out to Latino and Hispanic communities around the city, the Richmond Flying Squirrels plan to cook their famed mascot Parker the Rally Pig into carnitas for fans to enjoy, the team revealed Thursday. Help us afford a laptop charger by subscribing to our Patreon. 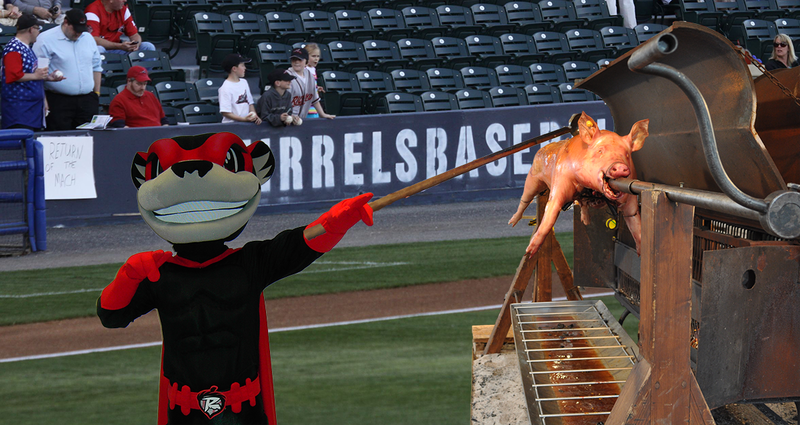 Although Parker officially retired in 2016, Flying Squirrels management was able to convince his owners to let the pig return for one final appearance at The Diamond after offering them $75 and one of the new lucha libre jerseys. “Rising food costs combined with dwindling fan interest in our half-assed fireworks show has forced us to get creative,” Bruce Armitage, the Squirrels director of sales said, explaining that the soon-to-be-eaten mascot is the unfortunate victim of the team’s new marketing strategy. The first 800 fans will be able to enjoy the beloved mascot, which will be slathered with chili powder, garlic, and cumin and cooked in a copper pot, along with the team’s new Seventh Inning Salsa. Fans can also purchase $2 Tecate tallboys to go along with their servings of slow-roasted Parker. Wear your colors for satire; visit our online store.